A piece of manually cracked glass symbolizes breakthroughs achieved by women past, present, and future. A tribute to all the women who have ever crushed it, the Shattered Glass Ceiling Paperweight® symbolizes all the breakthroughs achieved by women past, present, and future. 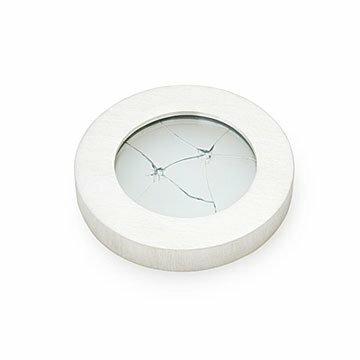 The piece of manually cracked glass is displayed between two solid panes, and the design is set in pewter with "Shattered Glass Ceiling Paperweight" engraved on the bottom. Handmade from imported materials in Lincoln, Rhode Island. Unique patterns are created when the glass is broken, making each piece one-of-a-kind. Check out our Shattered Glass Ceiling Necklace® here. 2.75" dia. ; .45" H; 6.3 oz. My friend said she liked it - I haven't seen it yet, as I live in a different state. I liked how unique the gift is, but it was much smaller than I expected (especially for a paperweight) and I thought the frame would be white and it was brushed stainless steel. A terrific idea. I did think the piece needed more "cracks"-- the pictured piece had many more than the one my niece received. But overall, a great gift for a feminist young woman who seeks to change the world. It was smaller than expected but still very nice. This was a gift for a friend/coworker who was moving on to another job. She appreciated the message on the box (a definition of glass ceiling) and the meaning. Personally, I had expected it to be larger, but it was heavy enough to do it's job. It made a great gift. She really appreciated the handiwork of the designer as well. We spent about 10 minutes excitedly talking about how it was probably made. Nice symbolism and an unintrusive, elegant addition to a desk. Very unique and quality gift. This product is heavyweight, nice quality and easily engravable.